FILE - Prime Minister Hun Sen of the Cambodian People's Party shows off his ballot paper before voting in local elections at Takhmau polling station in Kandal province, southeast of Phnom Penh, June 4, 2017. Following the closing of independent media outlets and the arrest of Cambodia's opposition leader, officials in Phnom Penh have begun training their verbal fire on the U.S., adding to mounting anxiety in the Cambodian capital among government critics and media workers. On Friday, senior Cambodian military officials pledged “the elimination” of all foreigners deemed intent to commit aggression against the country, according to statements reported by government mouthpiece Fresh News. The comments were posted on the same day Prime Minister Hun Sen declared two American "spies" plotting to overthrow his government had been identified and ordered the investigation of all U.S. citizens suspected of conducting espionage. In the same speech, he also suggested the U.S. Peace Corps should pull out of Cambodia and the week before he suspended a program to identify and repatriate the remains of U.S. soldiers lost during the Vietnam War. In statements to the pro-government Fresh News website Friday, Lieutenant General Prum Pheng, Commander of Intervention Brigade 1, and Lieutenant General Bun Seng, a Deputy Commander of the Army and Commander of Military Region 5, vowed to carry out the investigations ordered by Hun Sen.
“We all are the soldiers who have the duty to protect the land. [We] support Samdech Decho [Hun Sen], Prime Minister of Cambodia who rescued Cambodia from the war, to be united to eliminate any invading foreigners,” they reportedly said in identical statements. Defense Ministry spokesman Chhum Socheat defended the right of the lieutenants to issue such threats and would not unconditionally guarantee the safety of foreigners against such actions. "The situation is normal and the government protects all foreigners unless they did something wrong or against the government," he said. “We welcome all foreigners who come for tourism legally and don’t do any act against the government and national security,” he said, adding that the internal security is normal. The definition of what constituted an “act against the government” is being interpreted increasingly broadly under vague Cambodian espionage laws, said Phil Robertson, deputy Asia director of Human Rights Watch. In June, Australian filmmaker James Ricketson was charged with espionage under a provision in the Cambodian Criminal Code that criminalizes receiving or collecting various types of information, objects and technology that “may undermine” national defense “with a view to delivering power to a foreign state or its agents”. Details about the precise accusation against Ricketson — a vocal critic of the Cambodian government - have not been offered though it is known he faces up to 10 years in prison. “There’s a new plan to try to intimidate, to threaten and to control foreigners in a much more systematic way,” Robertson said, adding that he believed Cambodians with foreign passports would soon be targeted in the same way. The U.S. Embassy declined to comment on the statements directing a reporter back to Ambassador William Heidt’s comments during a press conference last week. “The fact several military officials [as well as Hun Sen] have made the same sort of statement suggests the external communication of the CPP government is being internally coordinated,” he said in an email. In the past month, The Cambodia Daily newspaper, which is owned by Americans, has been shuttered over a disputed tax bill, the U.S.-funded Radio Free Asia has closed its in-country operations citing threats and the National Democratic Institute has been kicked out of the country. The opposition leader, Kem Sokha, was arrested earlier this month for allegedly conspiring with Washington to overthrow the Cambodian government based on a years old video in which he discusses U.S. support for his promotion of grassroots democracy. 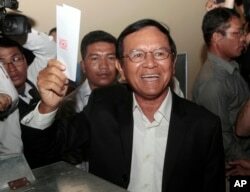 FILE - Opposition Cambodia National Rescue Party President Kem Sokha shows off his ballot before voting in local elections in Chak Angre Leu on the outskirts of Phnom Penh, Cambodia, June 4, 2017. Political commentator Meas Nee said support for the current crackdown was far from universal among the cross section of senior military officials he is in contact with, even if they made outward demonstrations of loyalty to the cause. “They have to express their support although they don’t agree to what has been happening now. 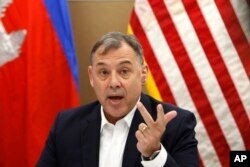 Position and wealth are believed to be the key factors where [by] they must support,” he said.